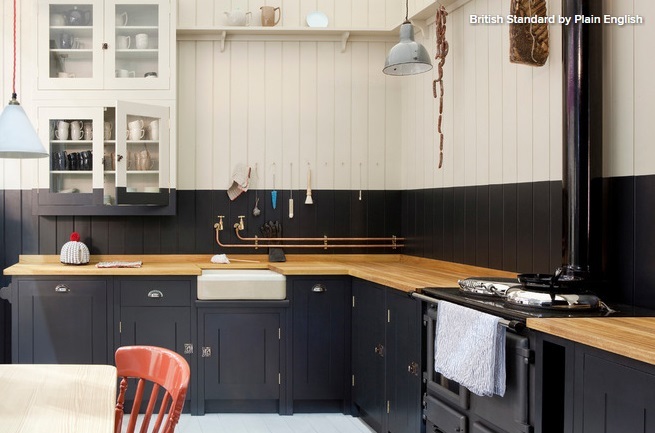 The fashion for slate grey, darkest blue and even black in modern kitchen décor shows no signs of abating. 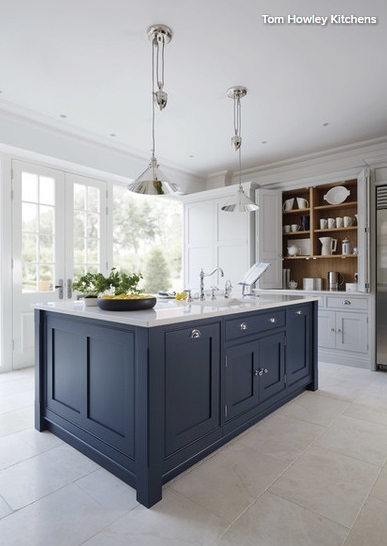 If sleek shapes, high gloss and cutting-edge materials leave you a bit cold, however, there are plenty of ways to work the look into a more traditional-style kitchen, as these schemes demonstrate. If you’re brave enough, go all out for deep colour. 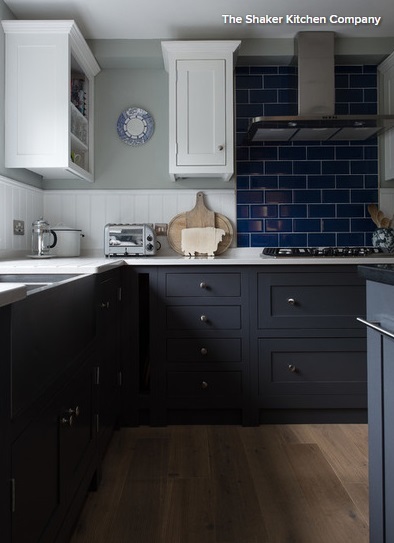 Opt for cabinets, walls and shelving in a deliciously dark hue, adding a break here and there with white worktops, splashback (both in marble here), farmhouse sink and some smart pale crockery out on display. 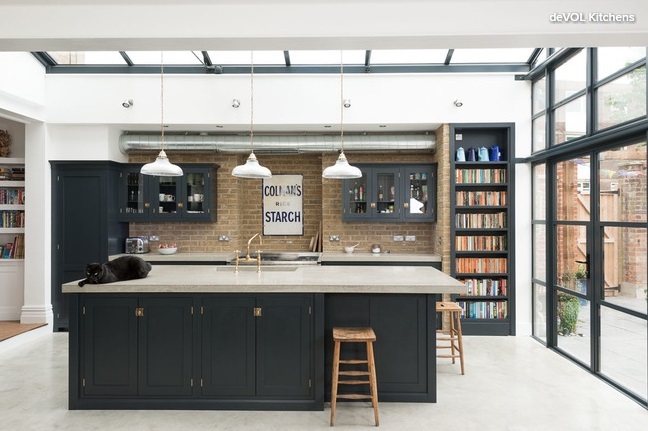 As well as being striking, you could argue this look is more sensible and hygienic, as the parts of the kitchen you want to really inspect are white, which will help you keep things cleaner. This dramatic room opens out on to a bright living space with double doors (off to the right of this picture), which helps to flood the space with light so it doesn’t feel gloom. 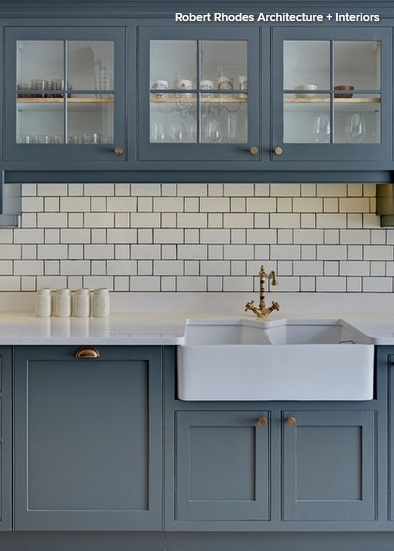 This scheme has a mainly dark palette, but the reflective quality of the shiny metro tiles in a similar blue to the main units helps to lift the overall look. Tile a small area or include another reflective surface in your kitchen to introduce a different finish and stop it looking flat. The scheme is also freshened by the white cabinets, dove grey walls and a white tongue-and-groove splashback. 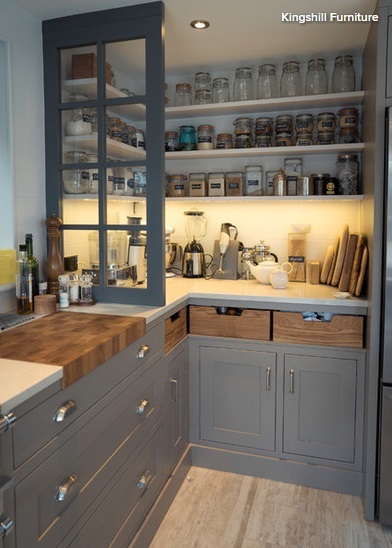 The tried and tested way to stack kitchen cabinets if you’re going for more than one tone is to have the darker colour on the bottom and the lighter colour at the top. This creates balance and ensures the space doesn’t appear too top heavy. 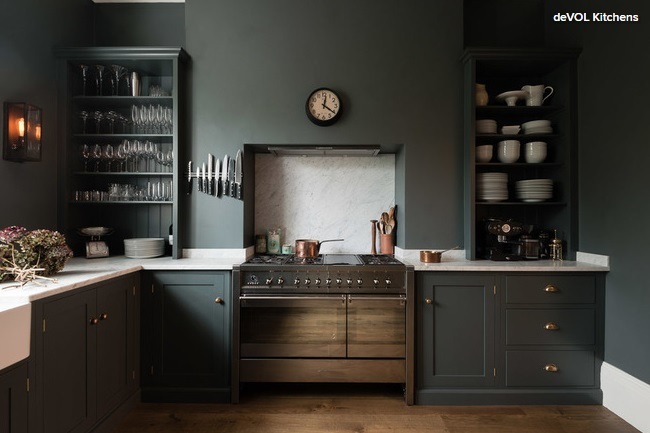 Blues and greys are currently getting most of the love where dark schemes are concerned, but forest green is also making an impact. Shown here in this Georgian-inspired design, it brings the country kitchen look effortlessly into an urban home. Open shelving in the cabinets provide the perfect spot for displaying decorative items to break up the block colour. The natural wood elements add warmth to this deep-hued scheme, while a clever combination of spotlights and brass pendants provide efficient lighting over the workspace and help to lift the look. One approach is to look for mismatched items in dark finishes and bring them all together. 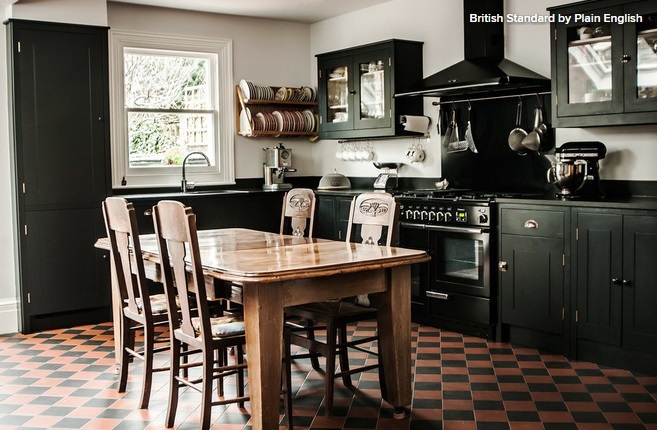 This country kitchen’s slate floor is in a similar shade to the dark cabinets, which helps to ground the look. This is definitely the way to do traditional with a quirky edge. It shows the separate treasures that are to be found in this inventive space. Unless you have great light, any darkly decorated room is going to feel a bit smaller, and if it’s too dark all round, it may end up seeming oppressive. The glass ceiling and vast wall of windows flood this room with sunlight, but not every kitchen is so well lit. Think about where your light sources are coming from if you’re planning a kitchen in a small space. Are there options to allow light from adjoining rooms through the walls? Perhaps you can install a skylight or a large glass door at the back? Any of these options will help set off a near-black scheme. In this dark grey kitchen, the pantry space in the corner would be too dim in the evenings to potter about in. However, the strip lighting just above the worktop illuminates the space and is a great solution for a dark corner. It also means you don’t have to compromise on your fondness for shadowy hues, or sectioning off storage areas. If you’re nervous about your lighting options, choose dark and moody cabinets, but use white elsewhere to lift the scheme. Here, white metro tiles, accessories, worktop, sink and flooring all light the way. This is the most popular option when it comes to using a stormier palette in a traditional kitchen. 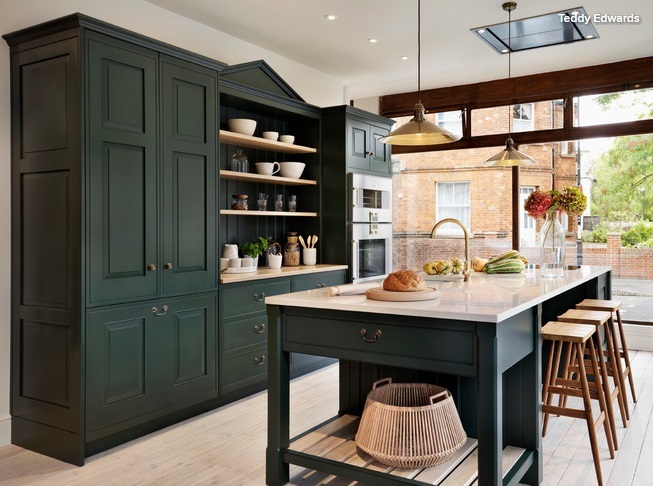 If you’re unsure about this look, try adding just one piece of cabinetry in a darker colour, such as a kitchen island, and keep the rest of your scheme light and bright, as seen here. This rough-edged marble floor also helps to soften the look with its grainy texture. 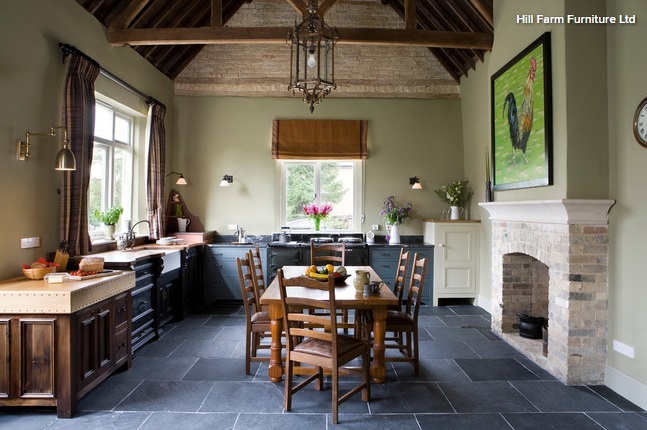 Opting for one standout piece has the effect of drawing people towards it, which can make for a very sociable kitchen. Here, a matching shade has been used on the wood panelling as on the units to bring the colour higher up the wall. It helps the kitchen’s industrial elements stand out and the paint has a satin finish, so it also acts as a splashback. Include more than one dark hue in your scheme. 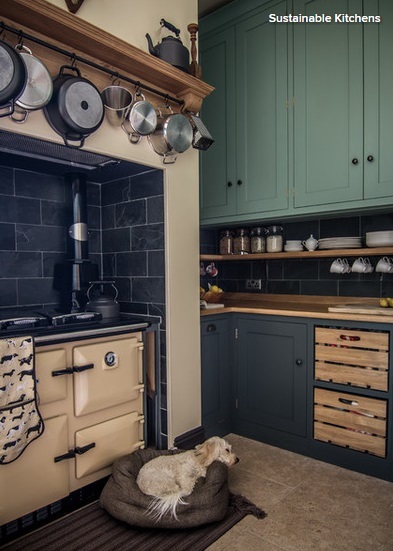 In this kitchen, blue, green and the neutral shades in the range cooker and wooden details work together beautifully. Sage green really lifts a dark spot in the tricky small space beside the mantel, and the oak storage crate drawers help to break up the large expanse of dark grey cabinets. This look works if you ground two bolder colours with some neutrals, such as the cream walls and stone floor seen here. Wooden elements are the natural choice to accompany a dark kitchen. A wooden table works especially well and also helps to zone different areas. This table acts as an easy way to section off the places to eat and prepare food in the room. The chequered flooring in brown and black clay tiles picks out the colour tones from each area, bringing it all together for a harmonious look.